Chicago-area couple Laura Ricketts ( pictured left ) and Brooke Skinner were married June 6 in a wedding attended by family and friends. Ricketts, a co-owner of the Chicago Cubs, and Skinner, who works for Twitter, wore white dresses for the elegant wedding. 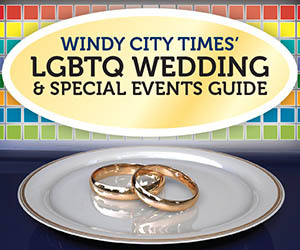 It was officiated by Lambda Legal Midwest Director Jim Bennett.